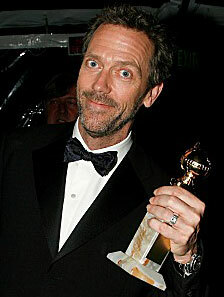 Miscellaneous :: Awards for "House"
"Hugh Laurie... is named an Officer of the Order of the British Empire (OBE)"
David Shore Won the 2005 Emmy for Outstanding Writing! Episodic television, drama: "Grey's Anatomy," "House," "Lost," "The Sopranos," "24." Win: Emmy 2005 - David Shore won the Emmy for Outstanding Writing for a Drama Series for the Season One episode "Three Stories"
Win (2006): Writers Guild of America - "For Episodic Drama: "House, M.D." - Lawrence Kaplow - For episode "Autopsy". " "Three Stories" won the Humanitas Prize, for screenwriting that helps "entertain, engage and enrich the viewing public." from a "deekay" posting at the Television Without Pity's House Forum a quote from an AP story on it: "Judges cited its 'poignant probe into the pain and confusion that comes when someone we love disappoints us.'" See a transcript of his acceptance speech - note: it's more than half way down the page. In his speech Laurie said, "I am speechless. I'm literally without a speech. It seems odd to me that in the weeks leading up to this event, when people are falling over themselves to send you free shoes and free cufflinks and free colonic irrigations for two, nobody offers you a free acceptance speech. It just seems to me to be a gap in the market. I would love to be able to pull out a speech by Dolce & Gabbana." Win: TV Critics 2006 and 2005 July 23: "At the 22nd annual Television Critics Association awards" - the second win in a row. And see a picture of him on stage and comments about the speech. Nomination (winners will be announced Jan. 28, 2006): Director's Guild of America "Paris Barclay for the 'Three Stories' episode of 'House'"